The legend of Panagia Hozoviotissa Monastery on Amorgos passed through ten centuries by word of mouth before being recorded. The story goes that the “dark-eyed Mary” icon survived the second iconoclast period where numerous icons were destroyed, however two halves were thrown to the sea by a wise woman hoping to save what was left of the icon. One half was brought to shore at the foot of Profitis Ilias mountain and it was on this base that the monastery was created…The other half drifted to Patmos where another monastery was built and the two halves were miraculously reunited. In the monastery, visitors are particularly drawn to the painted icon of a ship traveling from Patmos to Amorgos caught in a storm with monks hailing Mary for help. 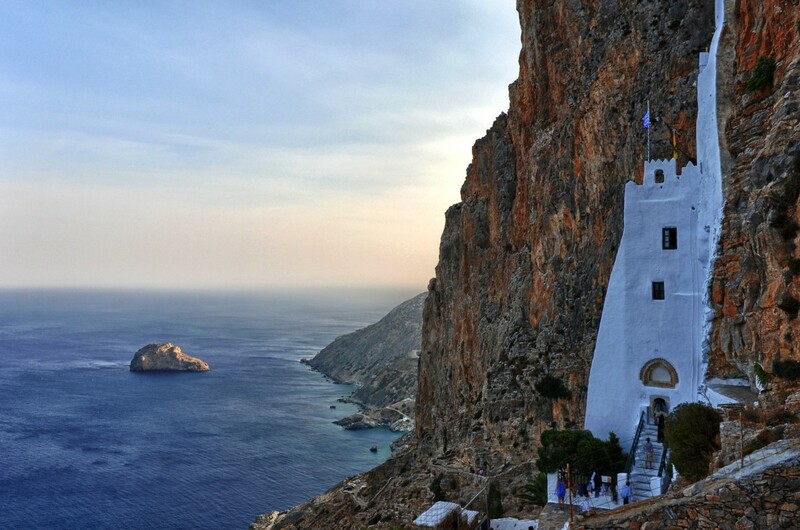 Perhaps it was the interesting stories of the monastery that fuelled the imagination of director Luc Besson when he decided to use Amorgos as the island from which to set his cult film, “The Big Blue”.